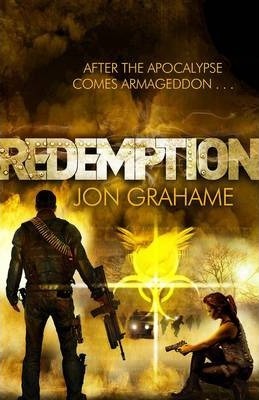 The final, climactic volume of Jon Grahame's hard-boiled apocalyptic trilogy It's been a year since the virulent flu-like pandemic known as "SuperSARS" wiped out more than 98% of the world's population. Ex-cop Jim Reaper and his small band of trained "enforcers" have successfully defended the little community of Haven that Reaper founded in North Yorkshire and it has become the hub of trade and cooperation between the dozens of peaceful settlements that comprise most of what's left of northern England. But not to the north, the city of Newcastle has become invested by a feral horde that Reaper knows will sooner or later turn rapacious gaze towards Haven. To the south is a regime called Redemption that claims to be the new seat of British government--claiming Prince Harry as its patron and with a full battalion of regular soldiers to enforce its authority. Reaper decides that what is happening in the south can no longer be ignored, and together with his ruthless young protege Sandra Hinchliffe, sets off to learn about Redemption for himself. Reaper and Sandra are soon embroiled in a bloody struggle for power that threatens to engulf and then enslave most of the country. And then, with Reaper and Sandra far from Haven, the feral horde takes to the road.